Congratulations to our November School Breakfast Challenge winners! 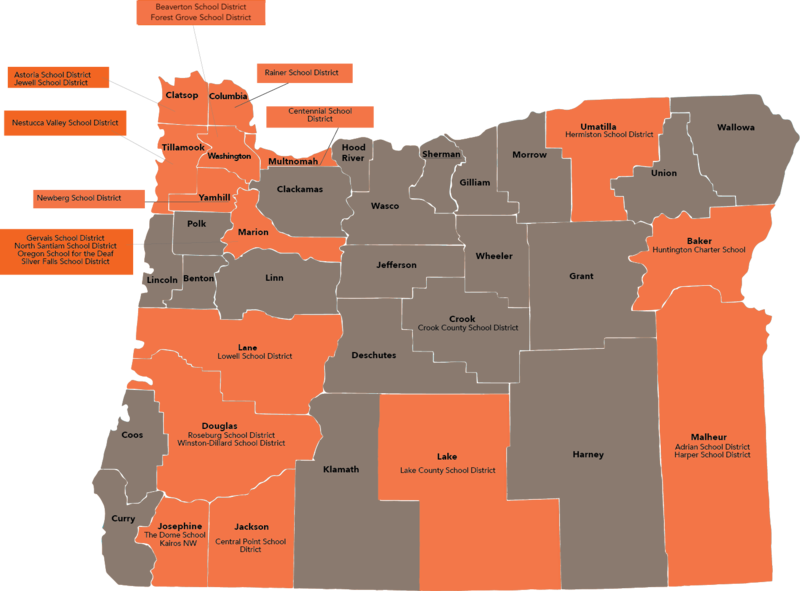 This year, 48 schools–representing 15 counties throughout Oregon–participated in the fourth annual November School Breakfast Challenge. Each day in November, these schools made sure kids started each day with breakfast! Join us in celebrating all of the participating schools! We greatly appreciate their time and dedication; from sending home extra parent materials, to adding new items, to even changing where and when they served breakfast–everyone went the extra mile to reach more kids! In this year’s challenge, participating schools achieved big results: more than 90,000 breakfast were served in November, increasing the number of kids eating breakfast in 2017 by fifteen percent! Sixty-three percent of participating schools boosted their breakfast numbers–that’s about 5400 kids connected. The November School Breakfast Challenge is a collaborative effort by the Let’s Do Breakfast, Oregon! Campaign, Partners for a Hunger-Free Oregon, Oregon Dairy and Nutrition Council, and Oregon Department of Education Child Nutrition Programs.